The purpose of the Outcomes Assessmentis to define measurable end-of-program student-learning outcomes (SLOs). Check out the current Sustainability Studies Advisement Form to see any new courses added under any of the three (3) Areas of Focus that may not appear in the current UNM Catalog. New courses are added to the Areas of Focus as they are developed. These must be approved by Program Director Professor Bruce Milne. Please note that it typically takes 4 to 5 semesters to complete the requirements for the Sustainability Studies interdisciplinary minor. 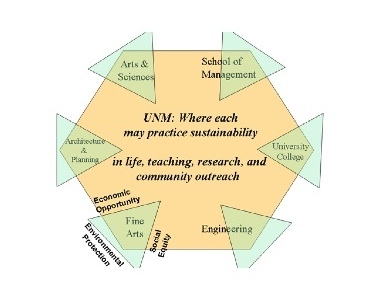 To schedule an appointment to discuss the Sustainability Minor Program or to declare the minor, please contact Terry Horger, Program Advisor at thorger@unm.edu.